Broken trust is hard to repair. Kaylee and Nash both want things to go back to how they were before the Demon’s Breath, before she’d be used. Before things fell apart at the end of My Soul to Keep. But you can’t just erase the past. 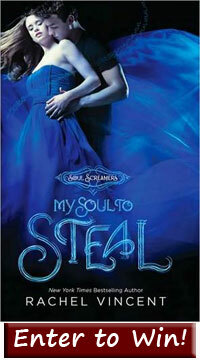 My Soul to Steal, the fourth Soul Screamers novel, focuses on what it takes to move forward. The goal alone is tough to attain, but add in the catalyst of Nash’s first love arriving in town to make Kaylee all the more insecure. Forgiveness and acceptance are hard fought, but letting go of the fears is much harder when every night deep-seated terrors of being lost, unwanted, betrayed and unworthy fill Kaylee’s dreams. And Sabine, Nash’s ex-girlfriend and living nightmare, is happy to fuel them. Sabine quickly makes it plain to Kaylee she plans on taking Nash back by any means necessary, and she has no problem playing on their fractured trust and Kaylee’s fears for the future. Sabine also has no problem throwing her sexuality around and making obvious plays for Nash. 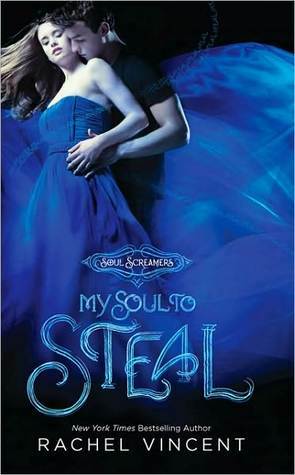 In typical Rachel Vincent fashion, My Soul to Steal will spark frustration at the characters and you’ll hate as you start to sympathize with Sabine. While there is action in this Soul Screamers novel, the main focus is the internal war raging within our banshee couple. Can they overcome their fears? Can they both grow and stay a couple? We won’t give you the answers, but we’ll tell you My Soul to Steal promises a heavy emotional journey that will have you questioning you allegiances. Check back tomorrow for an interview with Rachel Vincent where we talk Soul Screamers, boyfriend-stealing nightmares and Reaper Tod. The MY SOUL TO STEAL AND SOUL SCREAMERS SWAG contest is now closed. The winner will be announced on Dec. 30. 1. Fill out this entry form. 2. This contest is only open to residents of the U.S. and Canada. 3. Contest is closes at 11:59 p.m. CST on Tuesday, Dec. 28. 4. Winners will be selected using Random.org and announced on Dec. 30. Then they will be contacted via email and given 48 hours to claim their prizes. If we do not hear from the winner(s) within that time, new winner(s) will be selected. 8. A big thank you to Rachel Vincent for providing the prizes, and being all-around awesome. I been wanting to read Rachel Vincent for awhile, She’s top of my tbr pile. I LOVE this series and am so happy that you are having this awesome giveaway. I love the first 3 can’t wait to read this one! Great giveaway thank you so much for the chance! Can you remove me from this Giveaway? I wanted to be fair considering I just recieved a signed copy today.